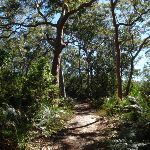 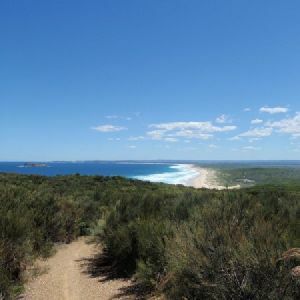 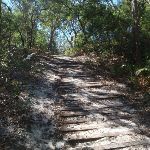 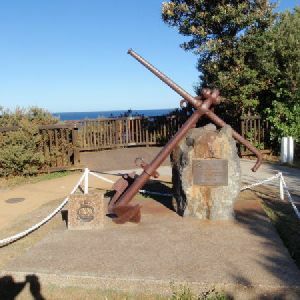 Veer right: From the intersection, the walk follows the right arrow on the ‘Lilly Pilly Loop Trail’ sign, along the sandy bush track, going up the hill. 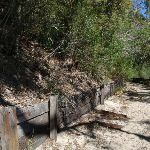 The track undulates through nice forest for some distance, with sections of erosion control board walkway, and timber retaining walls. 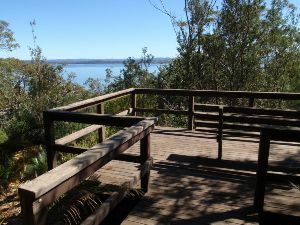 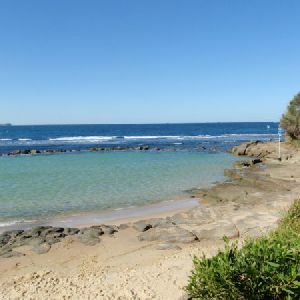 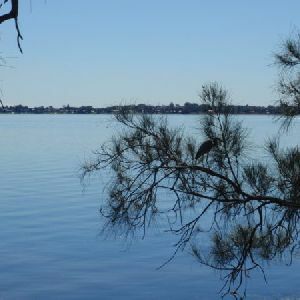 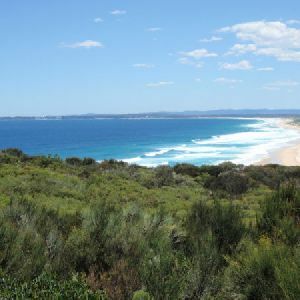 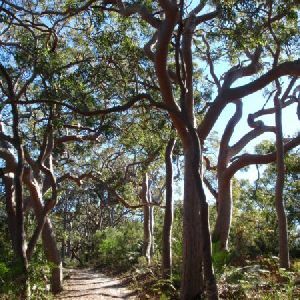 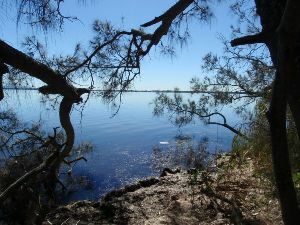 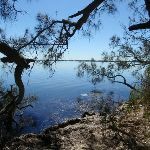 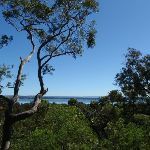 From here, the track offers great views of the lake, and passes through increasingly moist forest, before dropping a little and running along the edge of Tuggerah lake. 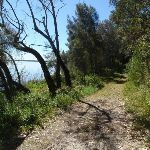 After running along the lake edge for a while, the walk reaches a lakeside vista where the track bends sharply to the left (heading away from the lake, into a thick, shaded section of forest). 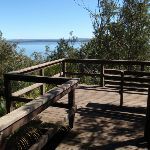 Veer left: From the lakeside vista, the walk follows the bush track, going into the thick, shaded forest, away from Tuggerah lake. 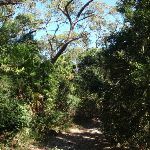 This beautiful section of the walk passes through an area of littoral rainforest. 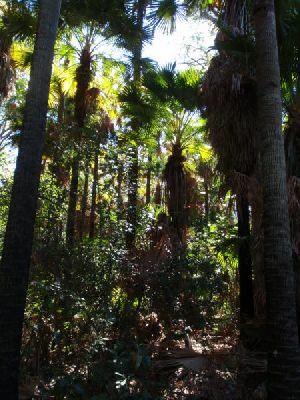 The walk passes a ‘Rainforests’ information board, to the right and continues through the forest. 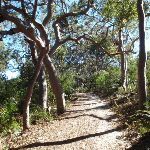 As the walk climbs a little, the forest becomes drier. 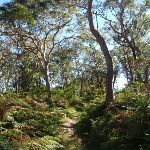 The walk continues along a ridge line for a short distance to reach the intersection signposted ‘Lilly Pilly Loop Link Trail’. 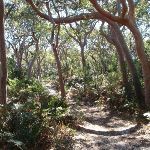 Continue straight: From the intersection, the walk follows the level, sandy management trail towards the nearby road (opposite direction to the signpost arrow). 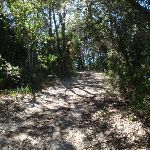 After a short distance, the trail bends to the right and goes down hill a little. 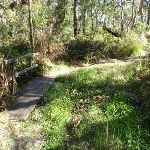 The walk passes an information board and ‘Lilly Pilly Loop Trail’ sign before going around a gate and arriving at the car park on the Central Coast Hwy, aka Wilfred Barret Dr (about 5.5 km north of The Entrance bridge, and about 4.6km south of the intersection with Main Rd, Noraville. 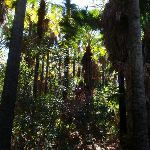 Signposted ‘Wyrrabalong National Park’). 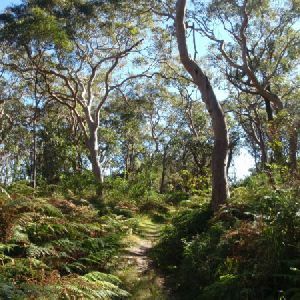 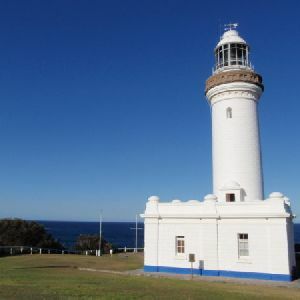 Around 3.8km of this walk has short steep hills, whilst the remaining 930m has gentle hills with occasional steps. 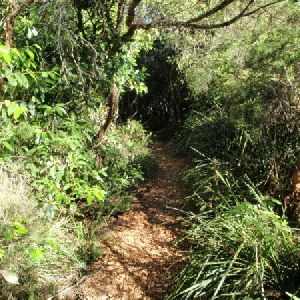 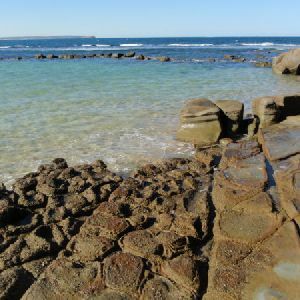 This whole walk, 4.8km follows a clear and well formed track or trail. 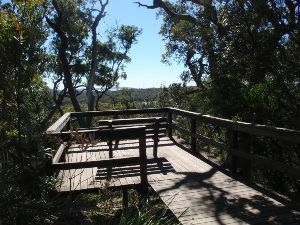 Around 4.1km of this walk has directional signs at most intersection, whilst the remaining 710m is clearly signposted. 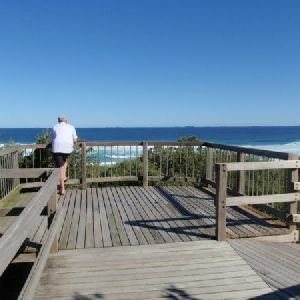 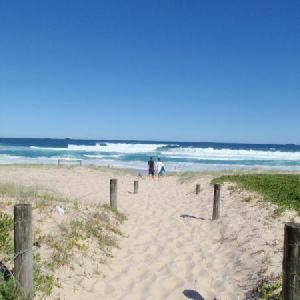 Around 3km of this walk has limited facilities (such as not all cliffs fenced), whilst the remaining 1.8km is close to useful facilities (such as fenced cliffs and seats). 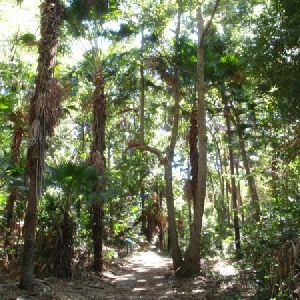 A list of walks that share part of the track with the Wetland trail to Rainforest walk. 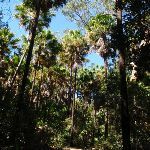 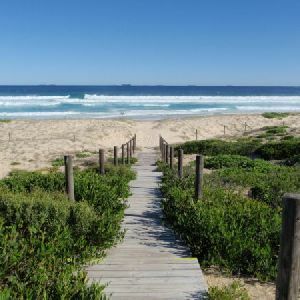 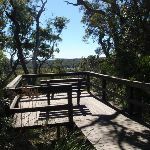 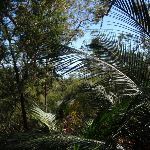 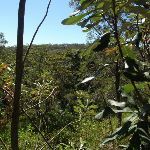 A list of walks that start near the Wetland trail to Rainforest walk. 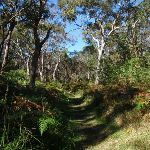 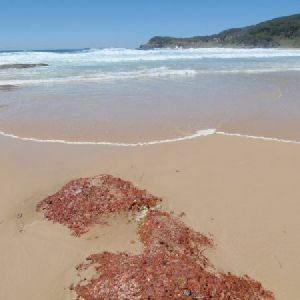 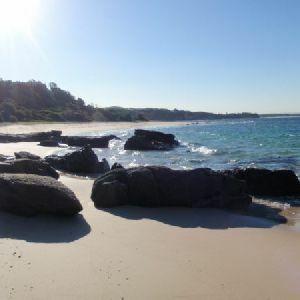 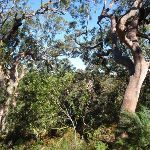 http://new.wildwalks.com/wildwalks_custom/includes/walk_fire_danger.php?walkid=nsw-wyrrabnp-wttr Each park may have its own fire ban, this rating is only valid for today and is based on information from the RFS Please check the RFS Website for more information.